I found Sarah Rumpf associated with this operation. She was arrested for drunken driving so I'm not sure she even has a license but I'll see what I can find. She's been talking to @dougsach Doug Sachtleben, the communications director for Club For Growth out in the open on Twitter. Funny thing is, while she tarnishes Donald Trump, she should probably look in her own backyard first. This is a 37 year old woman from Orlando, Florida with a P.O. Box in Austin, Texas. She has a long social media history that's easily traced. Somehow, she got involved with this election is out for Donald Trump's blood. She can be seen in the Club For Growth circles. This is the second woman we found working with Breitbart who is not Donald Trump friendly. The first woman is not even a conservative and she's concealing her real name. I guess this is what you call "covert operations". The AVVO listing for Sarah Rumpf says that she has an Limited-Liability-Corporation called Caffeinated Campaigns & Consulting, LLC. But the D&B report on this corporation says it's not active. Caffeinated Campaigns & Consulting, LLC filed as a Florida Limited Liability in the State of Florida and is no longer active. This corporate entity was filed approximately five years ago on Tuesday, February 23, 2010 as recorded in documents filed with Florida Department of State. Concerned Citizens of Winter Park, Inc.
Ciudadanos Para Etica Y Justicia, Inc. Concerned Citizens of Winter Park, Inc. filed as a Domestic Non Profit Corporation in the State of Florida and is no longer active. This corporate entity was filed approximately five years ago on Tuesday, February 23, 2010 as recorded in documents filed with Florida Department of State. Sarah E. Rumpf was listed as President and Treasurer. William G. Rumpf was listed as President and Vice-President. Gatorlando, LLC filed as a Florida Limited Liability in the State of Florida and is no longer active. This corporate entity was filed approximately eight years ago on Tuesday, May 15, 2007 , according to public records filed with Florida Department of State. Sarah E. Rumpf was listed as Manager. Erik V. Tortera was listed as Manager. Erik V. Tortera is currently the Director of Innovative Golf Group, LLC, an 8 year old company operating out of Florida. Caffeinated Campaigns, LLC filed as a Florida Limited Liability in the State of Florida and is no longer active. This corporate entity was filed approximately seven years ago on Wednesday, August 13, 2008 , according to public records filed with Florida Department of State. Sarah E. Rumpf was listed as Manager. Ciudadanos Para Etica Y Justicia, Inc. filed as a Domestic Non Profit Corporation in the State of Florida and is no longer active. This corporate entity was filed approximately seven years ago on Monday, October 20, 2008 as recorded in documents filed with Florida Department of State. Sarah E. Rumpf was listed as Director. Jose F. Torroella (an attorney in Florida practicing in the area of DUI and DWI) was listed as President. This picture is archived from her webpage snapshot from August 15, 2010. It makes sense now that she's a Rubio supporter joining in with Club For Growth to gang up on Donald Trump just like the MSM said they would be doing. This just goes to the fact that she's part of it. What doesn't make any sense is that these are the same politicians who asked for our vote so that they would CHANGE the Washington Establishment that was causing the country to go down the drain. These are the same politicians who said the same exact things that Donald Trump is now. Selling out like this is pretty disturbing but better to know now then not at all. These people are not team players in the conservative plight. On her webpage, she warns people about how to stay off her "list". Sarah Rumpf should adhere to her own rules. So far I've heard that Donald Trump is a "Progressive", a "Liberal", a "Trojan Horse" and other assorted lying nonsense. That's what you call misrepresenting an opponent's record and Sarah has issued personal attacks. Yes, it's "not cool". If you want to add us to your list, bring it on. You know what's really not cool, Sarah? Being so desperate that you would hand an election back over to the Democrats knowing that if they won this time, it's the end of this country. We fear nothing, not even lawyers, to make sure that's not going to happen again. This is our future! There's always the ethics committee if things get out of hand for being honest. What I'm reading out on social media are questions from people wondering why all these attacks on Donald Trump are happening. Who are the people behind it? What is their motive? They can't comprehend why a leader emerges and they can't just be happy. After so many horrid presidents, failed promises after two successful House and Senate elections and Tea Party upsets, they wonder whatever could be the motive behind being so stupid as to attack a co-candidate so viciously? Looking into people like Sarah, we can find those answers. What we're seeing is more than just a pattern of people who have gravitated to Club For Growth. There's a reason for that pattern I'll get into here. 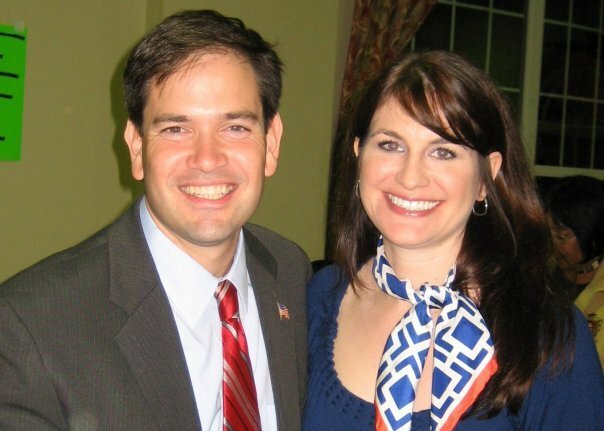 As you saw above, Sarah Rumpf has a long history with Marco Rubio. In a piece she wrote for Breitbart back in April, 2015, she disclosed that unlike other states, Florida doesn't allow a person to run for senate and president on the same ballot. Florida elects the next Senator of their state concurrent with the presidential election on November 8, 2016. This means that Rubio has to relinquish his seat. The stage has already been set for Club For Growth to move Ron DeSantis into Rubio's vacated Senate slot. That means it's win the nomination or bust for Rubio. Sarah Rumpf plays the role of what's called, "paving the way". She's there to cite endorsements, praise, divulge inside the Beltway information and prep voters by painting the behind the scenes deals on a great looking canvas. That's all fine, well and good until she starts attacking Donald Trump while not understanding why the voters are not going to elect Marco Rubio. Sarah needs to understand that Rubio is not winning because of his policies and being absent for votes where he was elected for that reason. Rubio being for the Trans-Pacific Partnership Agreement has hurt him more than he realizes. Wikileaks exposing the secret deal with Obama that bypasses the Constitution entirely has all but caused a bi-partisan riot. Rubio's willingness to acquiesce to amnesty after never having secured the border in his entire career in office has caused doubt on his word and fitness for office. On June 24, 2015, by a vote of 60-38, the Senate approved trade promotion authority (TPA) as part of HR 2146 - Defending Public Safety Employees' Retirement Act. Marco Rubio was one of two Republicans who did not vote on the bill. On May 22, 2015, the Senate passed HR 1314, which was used as a legislative vehicle for trade legislation with the titles "Trade Act of 2015" and the "Bipartisan Congressional Trade Priorities and Accountability Act of 2015," by a vote of 62-37. The bill proposed giving the president trade promotion authority (TPA). The bill also included a statement of trade priorities and provisions for trade adjustment assistance. Rubio voted with 47 other Republican senators to approve the bill. Ann Coulter had a say adding her opinion of Rubio's take on amnesty. The Democrats never change their ideas; they change the voters. For decades, Democrats have been working feverishly to create more Democrats by encouraging divorce (another Democratic voter! ), illegitimacy (another Democratic voter!) and Third World immigration (another Democratic voter!). Strangely, some Republicans seem determined to create more Democratic voters, too. That will be the primary result of Sen. Marco Rubio's amnesty plan. IT'S NOT AMNESTY! Rubio's proponents cry. They seem to think they can bully Republicans the way the Democrats do, by controlling the language. Rubio's bill is nothing but amnesty. It isn't even "amnesty thinly disguised as border enforcement." This is a wolf in wolf's clothing. So it's really about candidates who compromise their conservative principles that Sarah Rumpf and Club For Growth don't seem to get and why so many Republican voters didn't even turn out for Mitt Romney in the 2012 election. But instead of embracing candidates who do speak to conservatives like Ted Cruz and Donald Trump, they demonize these men with untrue labels such as "not conservative", believing that if they say it enough, it must be true. The truth is, these are the Republicans that conservatives have been waiting for and why we see more Trump/Cruz or Cruz/Trump noise out in social media more than you'll see any other pairing among candidates. The motive behind it all is that Rubio has no future if he doesn't take the presidential nomination. People like Sarah Rumpf in coordination with Club For Growth and the Washington elite (GOPe) have taken the position that they intend to play a no-holds barred campaign even if it means loudly pointing at Donald Trump's insults while expecting no one to see that it's them doing the most insulting and devious planning than Trump is responsible for with Marco Rubio's blessing. Not to mention plenty of other candidates doing the same that we intend to get into more. It's ugly. It's unfair. It's dirty politics and the people behind it should be exposed because un-Godly, rotten people don't belong in Washington, D.C. and need to learn that they work for us and we're insulted that they believe we are so easily managed by them.